Parkinson’s disease is the second most common neurodegenerative disease after dementia, affecting more than ten million people worldwide. In Australia alone, more than 70,000 people have the disease – that’s one in every 340 Australians. 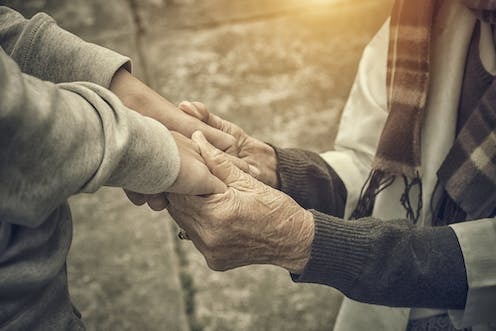 While Parkinson’s primarily affects adults over the age of 55, 20% of those diagnosed with the condition are under 50, and 10% of cases occur in those under 40. The estimated costs of Parkinson’s disease to the Australian economy add up to almost A$1.1 billion, a number that has almost doubled since 2005. Given the prevalence of the disease is estimated to double by 2030, the search for a cure is critical. Treatment in Parkinson’s day was radical. He advocated venesection, or bloodletting from the neck. This was followed by the application of substances to induce blistering of the skin and the insertion of small pieces of cork into these blisters to lead to pus discharge. Since then, we’ve come a long way. 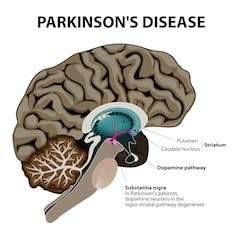 The basis of Parkinson’s is loss of cells that normally produce the neurotransmitter dopamine in an area of the brain called the substantia nigra. The involvement of the substantia nigra has been known since the late 19th and early 20th century. But it wasn’t until the discovery of dopamine’s role in the disease in the 1960s that drug therapy made significant progress. 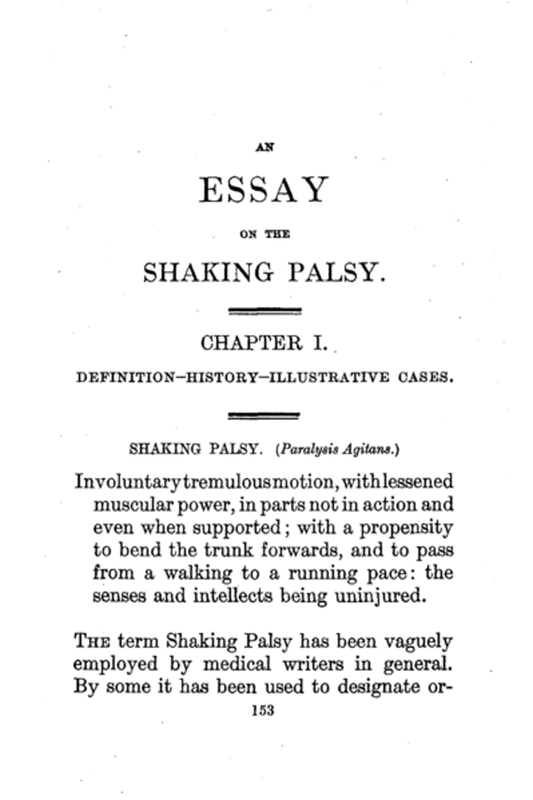 Before that, there was Parkinson’s technique (described above), as well as some other dubious methods recommended by French neurologist Jean-Martin Charcot in the later 19th century. These included rest and reduced stress, as well as therapy in which rhythmic vibrations were delivered via a shaking chair. Charcot also trialled a Russian pulley and harness system designed to suspend the patient in mid-air and stretch the spinal cord. But, despite some improvements in rigidity, this was quickly abandoned due to patient stress and side effects. The first drug treatments introduced by Charcot and his student Ordenstein in the 1860s provided mild benefit. They were drugs such as hyoscyamine and others made from the plant belladonna. Charcot and Ordenstein trialled these because they noticed individuals with Parkinson’s often drooled, and these drugs were known to dry up saliva. The drugs led to unexpected, but mild, improvements in motor symptoms such as tremor, muscle rigidity and slowed movement. While the reason for their effectiveness wasn’t understood then, today it is known they block receptors for the neurotransmitter acetylcholine, which works in balance with dopamine – similar to a seesaw. Decreasing excessive activity of acetylcholine helps increase that of dopamine. Hyoscyamine and other anti-cholinergic drugs would remain the primary means of treatment for the next 100 years. 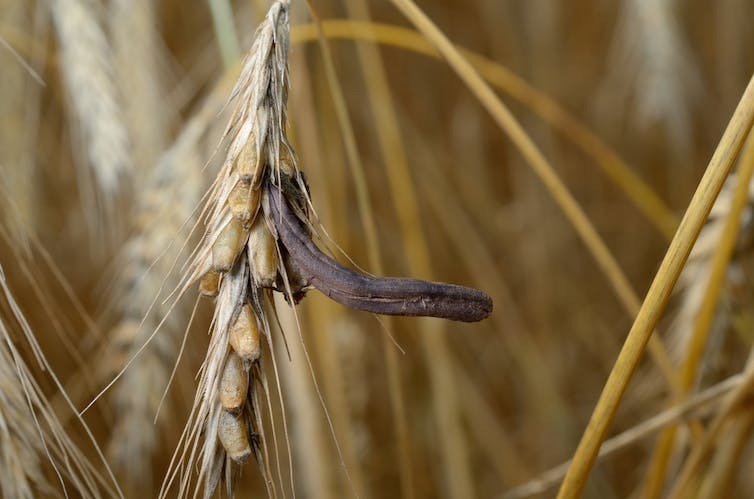 Other early drug treatments included derivatives of ergot, a fungus that affects rye. Today we know these mimick the effects of dopamine in the brain and many of the modern dopamine-mimicking Parkinson’s drugs are based on these compounds. 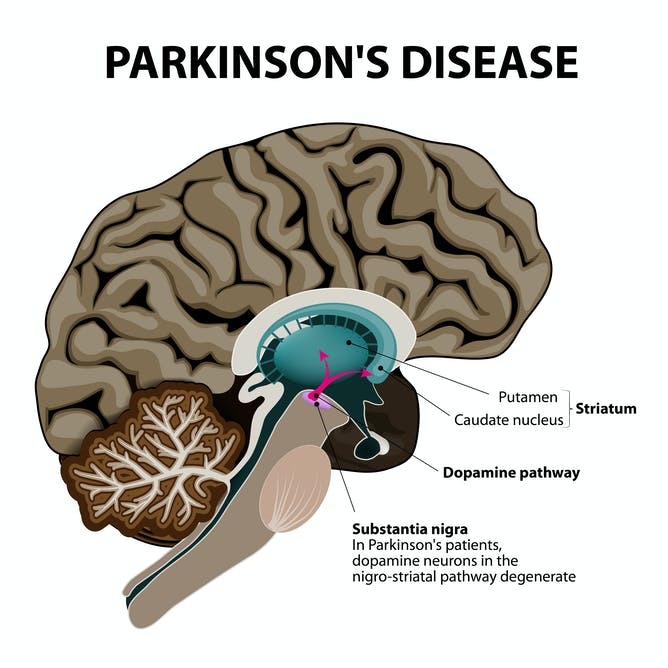 A Parkinson’s treatment revolution was sparked by the late 1950s discovery that dopamine was located primarily in a part of the brain called the striatum. This area is connected to the substantia niagra by a long nerve cell through which it releases dopamine into the striatum. In 1960, Herbert Ehringer and Oleh Hornykiewicz discovered that dopamine was depleted in the brain of those with the disease. Dopamine itself is not able to cross the blood-brain barrier – a protective barrier that stops pathogens and other larger molecules from entering the brain through the blood. This means dopamine itself can’t be given as a medicinal treatment, since it will not be able to enter the brain. Further reading - Explainer: what is the blood-brain barrier and how can we overcome it? So in 1961, levodopa – a dopamine “precursor” that is transported across the blood brain barrier into the brain and converted into dopamine – was trialled for the first time with beneficial effects. Levodopa leads to significant improvements in motor symptoms in the majority of people. In some people in the early stages of Parkinson’s disease, it leads to virtually normal motor movement. Today, levodopa remains the most effective and widely prescribed pharmacological treatment for the disease. It is often coupled with certain enzyme inhibitors, such as carbidopa (that stop the breakdown of levodopa prior to entering the brain), allowing more of it into the brain and increasing the amount of dopamine produced. Unfortunately, levodopa becomes less effective over time as dopamine neurons continue to die in people with Parkinson’s, requiring higher doses of the drug. Prolonged use is also associated with significant side effects. These include severe dyskinesia (involuntary, erratic movements) and a wearing-off effect, in which patients become stiff and slow in between medication doses. The wearing off effect may in part be addressed with slow-release forms of levodopa with carbidopa – such as Sinemet CR. This releases the drug over a longer period of time (four to six hours), leading to steadier levels of levodopa in the blood. But because of the slow release, the beneficial effects of Sinemet CR may take longer to come about. In 2015, the US Food and Drug Administration (FDA) approved Rytary, a drug that combines both immediate-release and extended-release levodopa beads to address this slow onset issue. However, this drug has not yet been approved for use in Australia. For advanced Parkinson’s disease, a slow-release intestinal gel form of levodopa together with carbidopa, called Duodopa, may be administered directly into the small intestine via a surgically-implanted tube. Duodopa received approval in Australia by the Therapeutic Goods Administration in 2008 and has been covered by the Pharmaceutical Benefits Scheme since 2011. This treatment, however, is only suitable in a relatively small number of patients in advanced stages of the disease. Surgery to implant the tube also comes with some risks, such as infection and bleeding, as well as potential clogging or dislodging of the tube over time. In addition to levodopa, a number of other drug treatment options are currently available, although none stop the progression of the disease. In those who have had Parkinson’s for several years, still respond to medication, but experience dyskinesia or wearing-off periods, surgical treatments are available. The most common is deep brain stimulation (DBS), in which constant pulses of electrical stimulation, similar to a heart pacemaker, are delivered to a specific area of the brain. This was approved in Australia for the treatment of Parkinson’s disease in 2001. Deep brain stimulation leads to significant improvements in many motor symptoms for the majority of people. People can often reduce their daily doses of medication by as much as 30 to 50% following the treatment. However, deep brain stimulation is not recommended for all Parkinson’s cases, and individuals must meet a strict set of criteria before having it. In a small number of cases, the surgery may be associated with complications such as seizures, bleeding or infection. Other issues can include the device malfunctioning down the track. All available treatments for Parkinson’s focus on symptoms. As it was for Dr James Parkinson, the ultimate goal of research is to develop a therapy to modify disease progression. Currently, a number of potential treatments are in development. These are based on reducing inflammation and preventing dopamine neurone cell death. There are others that aim to prevent aggregation of a protein called alpha synuclein, which clumps up in cells forming toxic aggregations called Lewy bodies. Others aim to provide substances that help stimulate cell growth, proliferation and healing to restore and protect dopamine neurons. Only time will tell if one of these will accomplish disease modification. 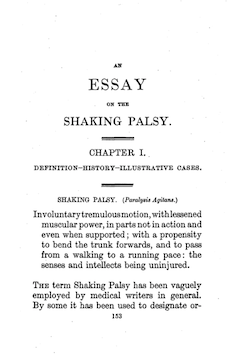 But 200 years on from Parkinson’s paper, the future of treatment remains hopeful. Lyndsey Collins-Praino receives funding from the NeuroSurgical Research Foundation.